The learning, improving, responsive, adaptive company is a long-lived one. 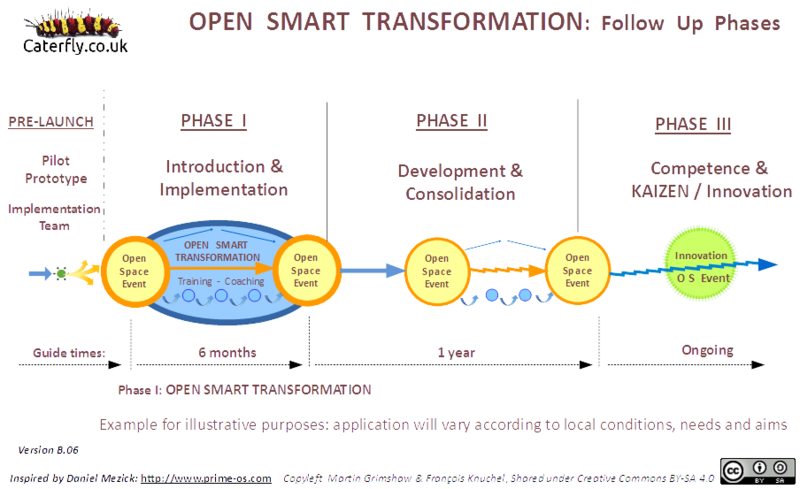 The Open Smart Transformation process is designed to embed ongoing engaged learning and development into the organisation. The central Caterfly process, with the coaching and experimentation framed by an opening and a closing Open Space event, is Phase I. After the first phase is complete the organisation is better equipped to organise without the need for constant support from consultants. Phase I is self-contained and can be regarded as a complete programme finishing with the final Open Space event. Some organisations, however, will want to optimise the momentum gained and develop further. Following our process, Phase II represents application of learning and new processes, consolidation and steady development. Phase II is marked by twice yearly Open Space Events for cultural integration. “By instituting these recurring events on the organisation’s calendar, there is less risk of dependency on any one leader or coach and the organisation becomes increasingly self-sufficient in the new culture.” (Daniel Mezick in Open Agile Adoption). Again our (Caterfly’s) contribution is in running the regular Open Space events as independent facilitators, to consolidate the change. We can also introduce the ULab process as part of the new culture. 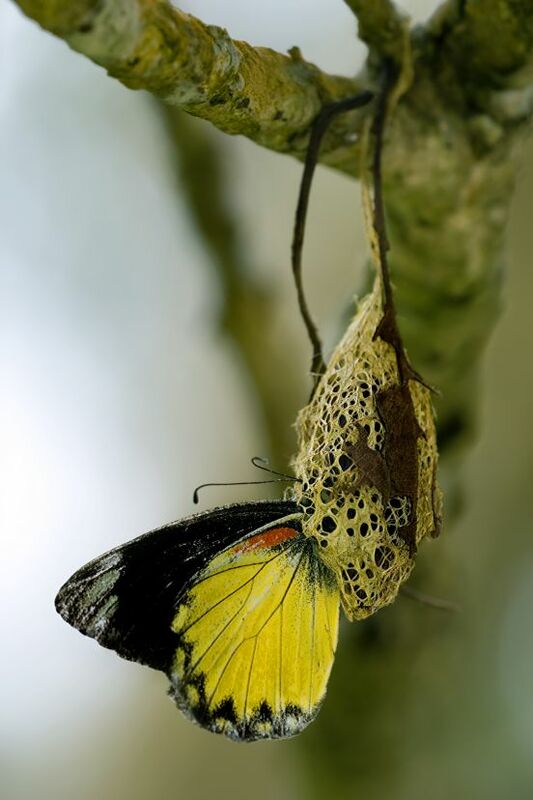 In the final stage of the Caterfly process, Phase III, the organisation moves to competence. In this phase the culture is open, and feels like being in an Open Space event all the time. Basically the organisation operates in a continuous change platform. In this open culture the organisation understands how to sense and respond. Consequently Open Space events are no longer pre-scheduled on a regular basis; instead they can be arranged as needed. The principles of Kaizen can be anchored, putting the organisation on a continuous but self-organissed process of improvement, innovation and renewal, with tools like A3 PDCA. Being in Kaizen mode everyone is in a constant mind-set of change and adaptability. This Kaizen platform makes the organisation both collaborative and competitive, and extremely responsive to external changes and to clients and users. In Phase III we may also introduce Kaizen through a series of simple workshops to create a Kaizen spirit within the organisation. This is important to both anchor the change as well as create a platform of self-renewal (auto-poeisis) within the organisation. To counter-balance a kaizen-only culture, we continue to run Open Space events, with a focus on radical out-of-the-box innovation, so Open Space Innovation events. This combination of ongoing continuous improvement in a kaizen culture with the disruptive innovation event is Caterfly’s unique contribution. Finally, it should be said that Phases II and III as presented here are theoretical. In reality it will depend on the culture of the organisation, where it wants to go and how agile it already is. Ideally the second Open Space Event of Phase I would be the beginning of the new organisation operating in permanent platform mode; in other words able to transform itself by itself with everyone involved. In practice this will rarely be achieved in just one round, several phases may be needed to get there, but that can only really be determined at the end of Phase I. The ultimate aim is an organisation operating of a self-managed ongoing change platform organically adjusting to markets and society. For a more technical description, see OST model. Caterfly’s Open Smart Adoption model is a derivative of Prime/OS™, details in preceding link. For some practical applications of OST, see our examples. For more insight into Phase III, see the relationship between Innovation and Kaizen.